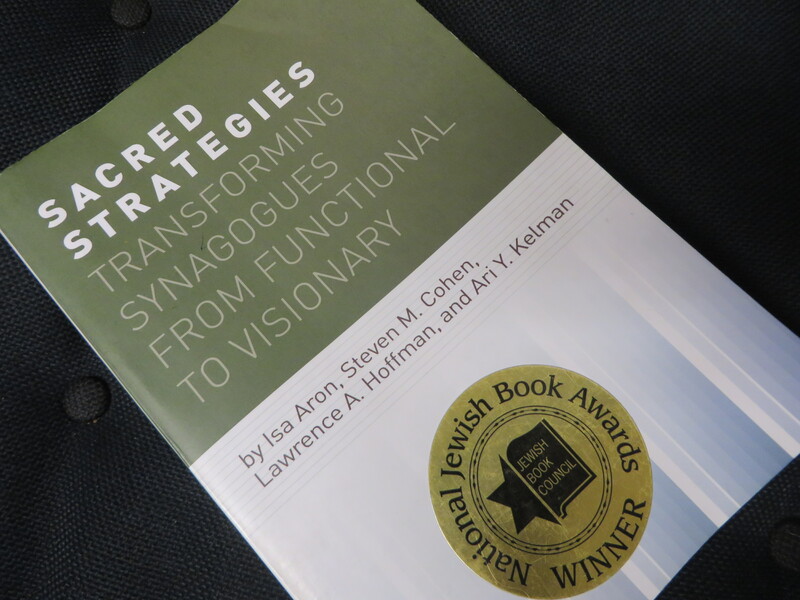 I did not know what to expect from Sacred Strategies: Transforming Synagogues From Functional to Visionary written by Isa Aron, Steven Cohen, Lawrence Hoffman, and Ari Kelman –except, of courses, that it was going to be about the American synagogue and its transformation. The book has as its central concern the liberal synagogue and is animated by the dissatisfatied sense that there the actuality of this institution does not match its potential as a sacred-space locus of deep and shared social meaning based on worship, education, and social action. The critique running throughout is that the modern American liberal synagogue, is a moribund institution segmented into function built on a pay-for-service model of membership and participation. The imperative is a design and re-design transformation. Based on the kehilla or community synagogue model, what the authors call a “visionary” synagogue is defined by sacred purpose, holistic ethos, participatory meaning (i.e. engagement and experience), a disposition for innovation, and reflective leadership (pp.10, 43-4, 214). While these things don’t get chapters of their own, aesthetic style and affect are key to “the visionary synagogue.” Against the old enlightenment rationalist model and steeped in the language of expressive individualism, the visionary synagogue is more aligned with 1990s neo-romanticism (or neo-neo romanticism) and postmodern primitivism (pp.50, 181). Discussed are the redesign of synagogue , (being, having, sharing, feeling of connection, transcendence, awe, reverence, surprise, delight, warmth, joy, fun, and feeling good). As affective dispositions, caring and spirituality are meant to be ubiquitous, suffusing and permeating the culture of the visionary synagogue. Having just read and recently posted about him, parts of the discussion reminded of network theorist Bruno Latour’s discussion of religion in Rejoicing, where the premium is put on felicitous speaking (Sacred Strategies, p.177), presence (p.178), and excellence (pp.176-7). But not just aesthetic. Religion we know reflects society, and also economic life. That’s my last takeaway from this book, not that the American synagogue is too consumerist, but is actually not consumerist enough. The authors here overrate the distinction between consumerism and visionary community (pp.29, 151). Indeed, what is the meta-model for the visionary synagogue if not itself corporate and drawn from corporate organization literature and thinking? More corporate than aesthetic per se, the drumbeating corporate values that permeate Sacred Strategies include the word “strategy” itself, and also “vision,” “innovation,” “the production of sacred goods (p.27), entertainment, “delivery of meaning” (p.37), change agents (39), experimentation, leadership and organizational culture, the link between technology-culture-society, adaptation and management experts, feedback from consumers, tasks forces, stakeholders, assembly teams, risk, and excellence. The reason that Sacred Strategies is a confused book is that its authors remain unclear or uncomfortable as to how to judge the very signal insight that they themselves bring to their discussion of the contemporary liberal synagogue regarding it’s root in the value schemes generated by larger economic systems and corporate thinking. The authors have shown their readers the neoliberal synagogue. This is what Entrepreneurial Judaism looks like from the ground up. Jewish thought and philosophy and Jewish theology have not really caught up to this cultural emergence. I’m thinking in particular of the new rabbis and theologians pushing meaning and spirituality, the idea of divine immanence and social justice, kabbalah and Jewish Renewal, new Jewish music inside and outside the synagogue, independent minyanim. Or if they have been caught up, they have been caught up completely unawares. Is this sacred strategy a case of barking up the wrong tree? Can a contemporary institution no matter how artfully redesigned and re-purposed ever actually or only virtually “embody” an “ancient term” for Jewish congregation such as kehillat kedusha (holy community) (pp.242-3)? Is that term a talisman to begin with, and if so, with what kind of effective power? To use old fashioned terms, the traditional community was more narrowly circumscribed into a tight space, a community whose members were thrown together by “fate” and by “destiny.” In contrast today the holy community forms together electively. The authors of this interesting and even important book have scraped the “surface,” which I mean as a compliment. Perhaps the point is that the synagogue has not been sufficiently consumerist, and now needs to meet what it’s members not just need but also want. As a social institution, the synagogue always reflects back its congregation. Can the synagogue learn to speak felicitously? Can it recoup its lost aura? Words and visions are strange things after all. Unable to “actualize” the past, set into its own place and time, into its own economic order and aesthetic style, perhaps the visionary synagogue might constitute something more persuasive than a relic, might reconstitute as a simulacrum with its own bright and shimmering qualia, deep inside the desert of the real. This entry was posted in uncategorized and tagged affect, American Judaism, synagogue. Bookmark the permalink.